This design finds its roots back in 2002. 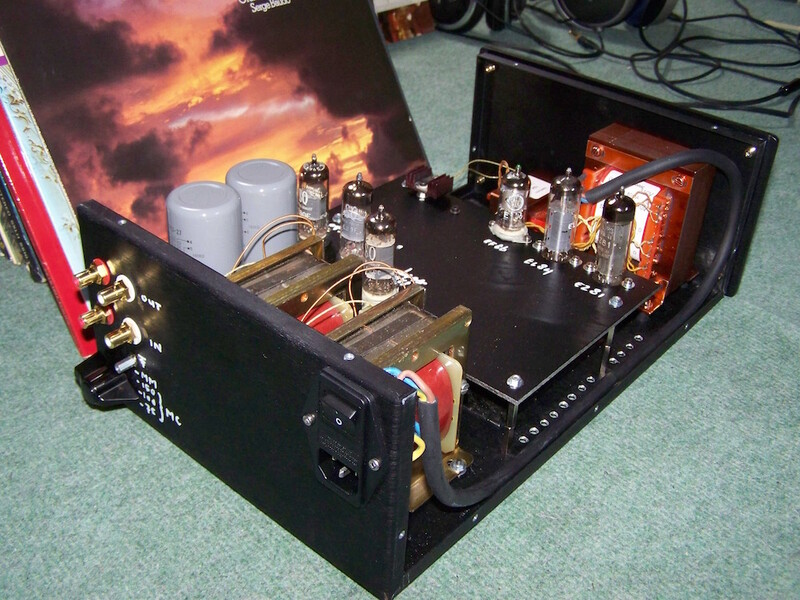 By then a DIY'er named Alex Torres from Netanya published an inspiring RIAA-amplidier design in the magazine RadioHobby. 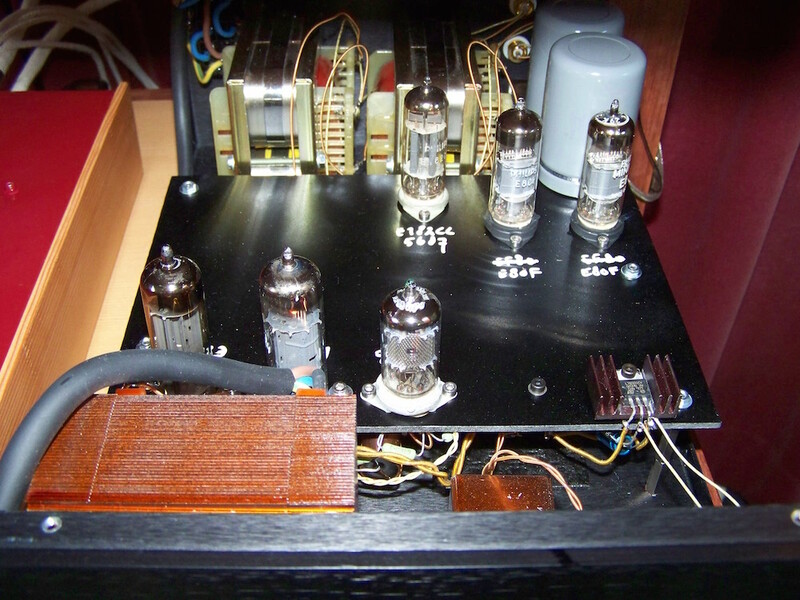 Inspiring since he incorporated the riaa-correction in the load of the input tube, that being a pentode. 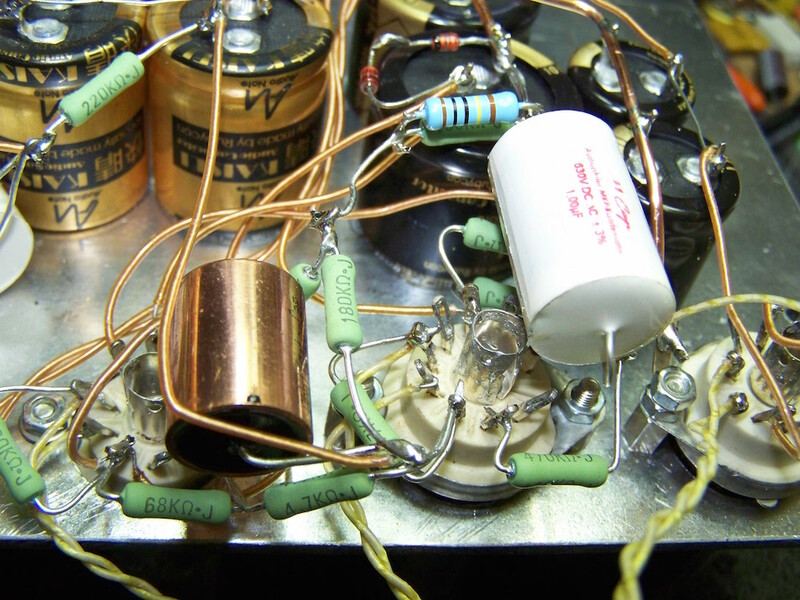 Further on it had a DC-coupled stage using a medium high gm triode. Alex Torres' original design (pdf here). This proofed interesting enough for Sacha Cokic of Trafomatic to adapt slightly and make it commercially available. 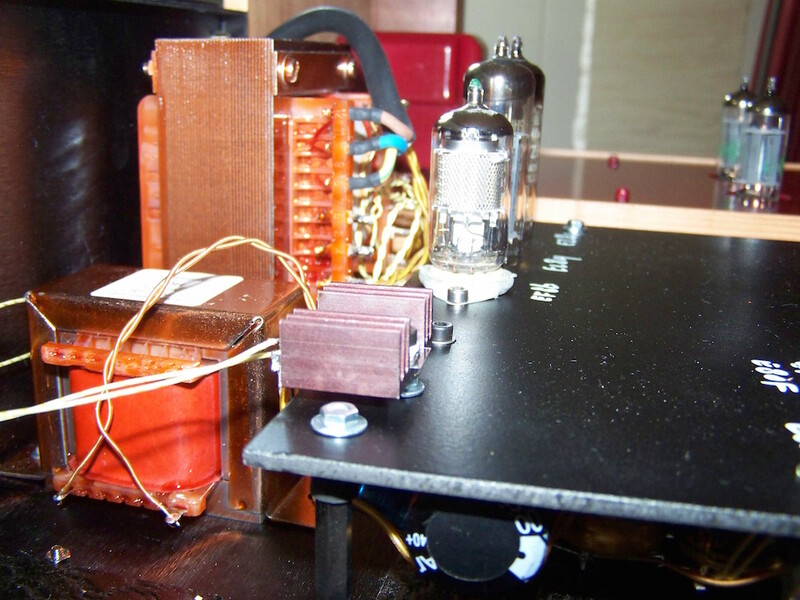 In my article about this Trafomatic phono amplifier, I explored some more possibilities such as replacing the capacitor output by a line output transformer and used it for many years with great pleasure. 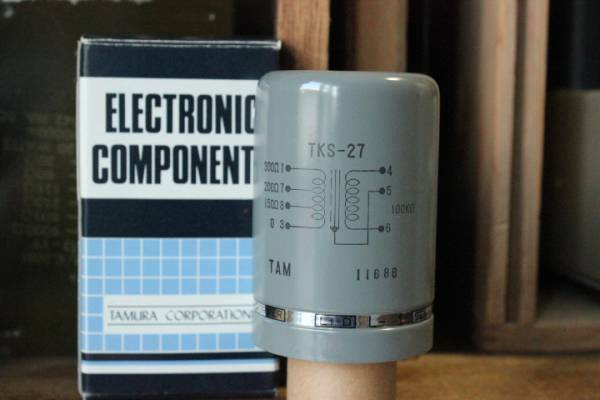 The used EF86 however can be noisy at times, so selection is a must, and the 6N6 triode is known to have a rather short lifetime (500 hours service life guarantee according to datasheet) which is not a nice thing since it is dc-coupled to the EF86. 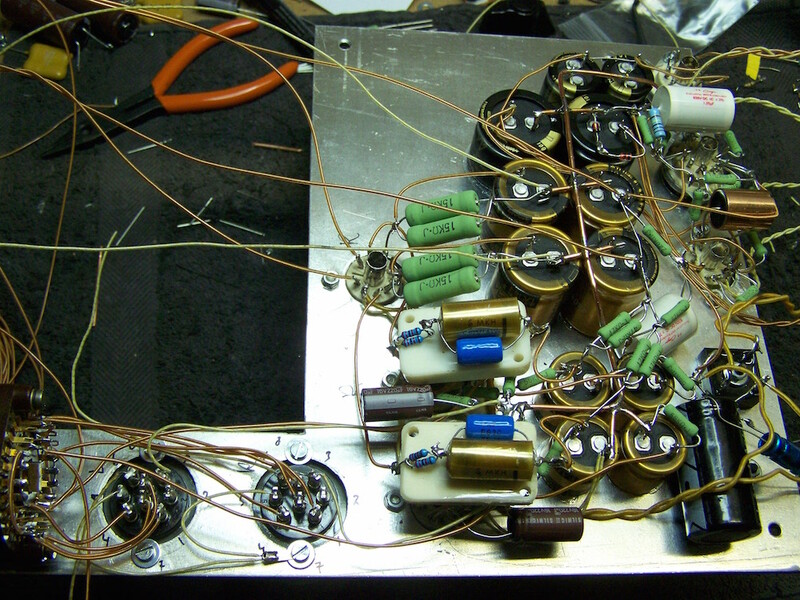 At times the degradation of the 6N6 resulted in distortion as the operating point shifted leaving not enough space on its grid for the EF86's output. These two aspects resulted in an adapted design using two different valves: The E80F and E182CC. Both are available in SQ, assuring a lifetime of 10000+ hours and the E80F is low noise compared to the EF86. Some minor changes in the circuit had to be made but proofed to be successful. 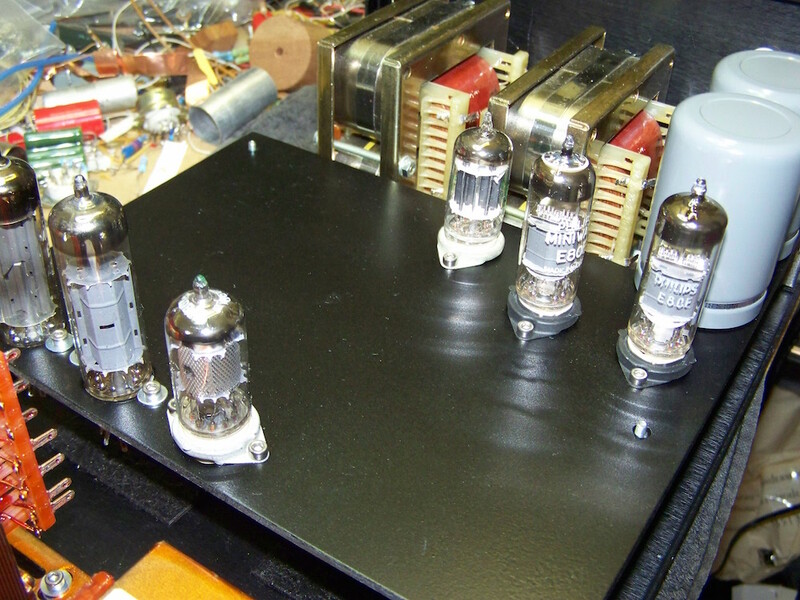 Soundwise I also preferred these valves over their predecessors, but hey, it was my own idea.. Since the E182CC is not that cheap anymore, it can be substituted by a 5687 which is pin-compatable. 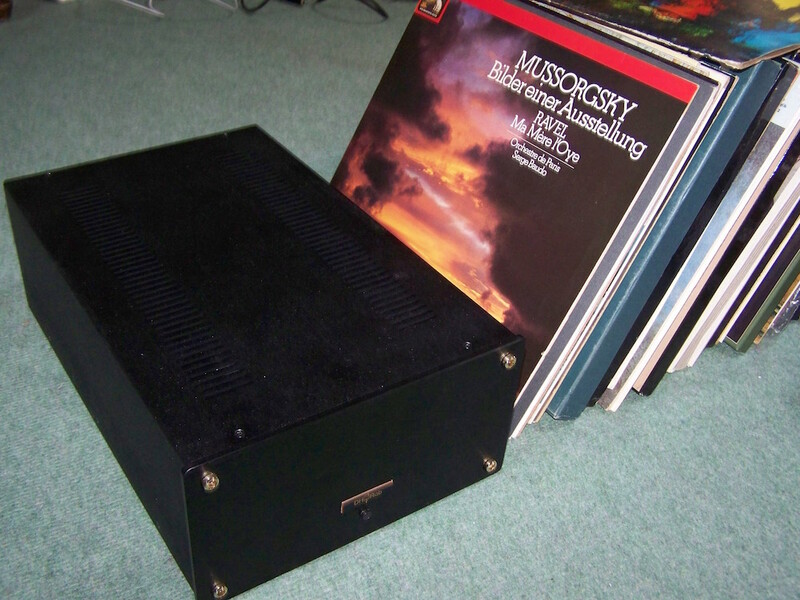 One thing to take into account is that it has higher heater current demand which pushes the used 78S05 to its limits, so adequate cooling is necessarily (use a big enough heatsink). 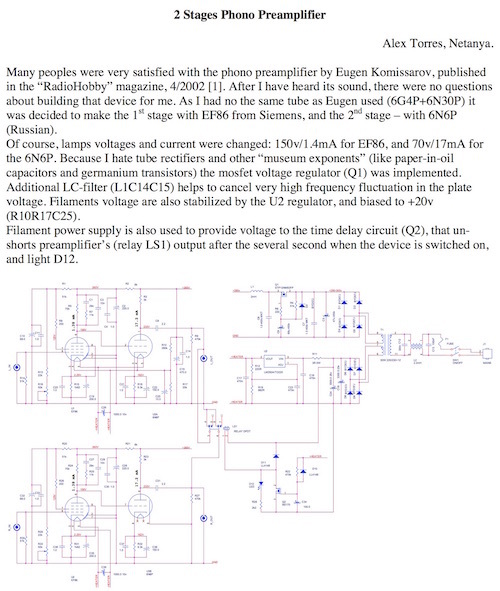 It has also slightly different operating points, but when the component values are respected, the E80F "will follow". It also has slightly less amplification but overall amplification will still be sufficient. Soundwise I prefer the 5687 over the E182CC since it has little more energy in lower frequencies and can be less microphonic, but as said, that is my preference. A friend asked if I would make one for him, since he liked it very much when showed at a demonstration day. Could this be done in "one box", including the MC step-up transformers? Well, I succeeded doing so, made MM and MC (with different step-up ratios) selectable from one pair of RCA-inputs.. Great! The MC step-up transformers are Tamura TKS27, fantastic quality but not cheap, unfortunately. They are shielded what makes installation less critical. So if you decide to use different, be aware of shielding. Also on component level this built is a bit cost-no-object. 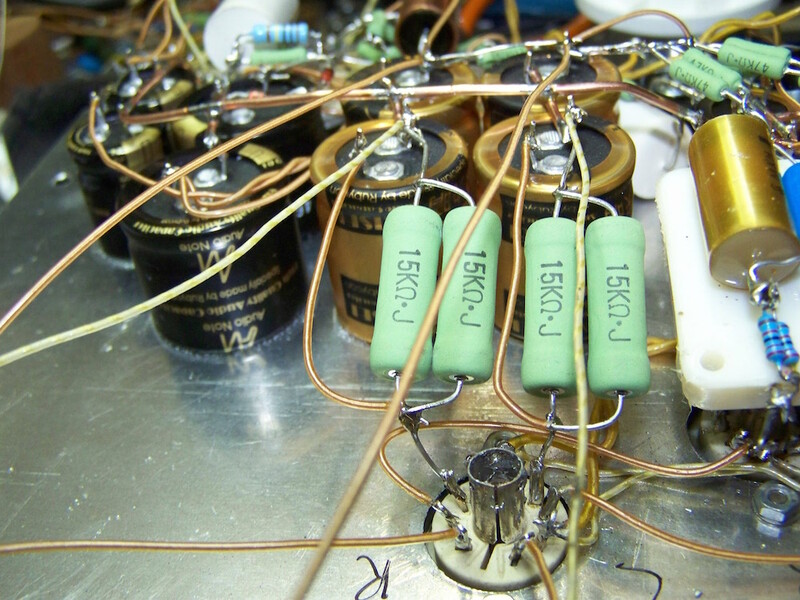 Plenty "audiophile" components are used which reflect the component values at time (such as the 5uF capacitors). One thing to take into account if building this all in one box, is distance. It is cheap and always available if taken into account prior to building. Distance will take care of transformer strayfields being transformed into hum. 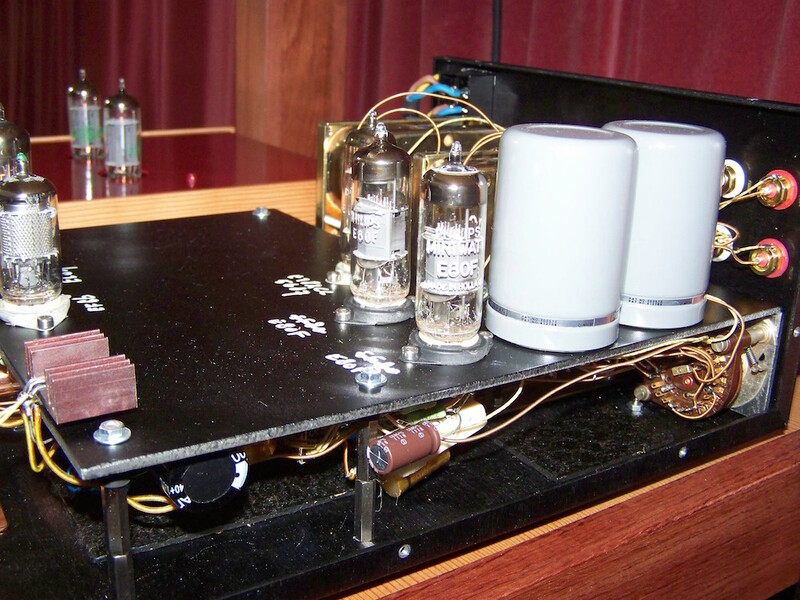 Hum is one thing that you do not want in your phono amplifier. So a big enclosure had to be found. 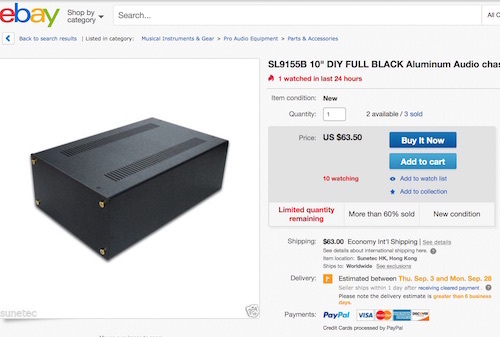 Nowadays there are plenty good looking chassis available on the internet, and an eBay search resulted in an AudioNote style chassis provinding enough space for distance between power transformer and MC step-up and line output transformers. 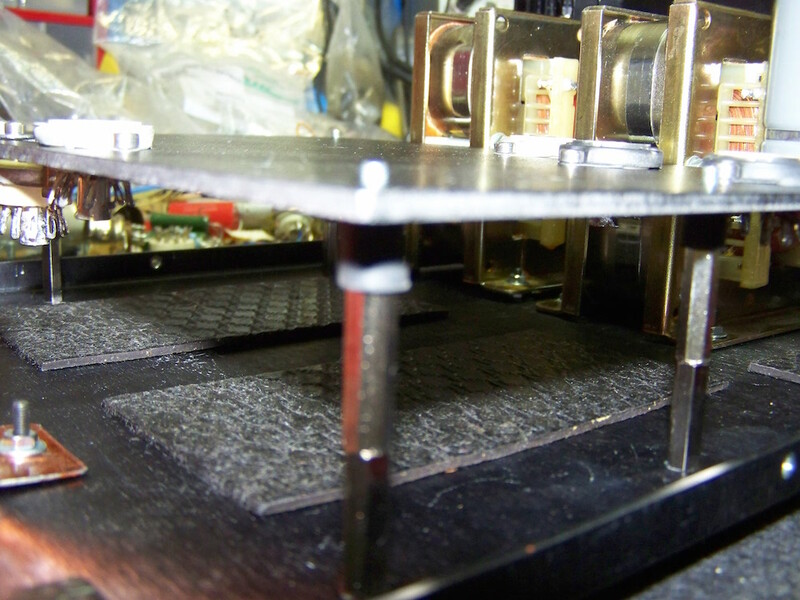 The powersuppy section and signal section are built on one 3mm thick aluminium sheet, allowing for efficient connections. This aluminium sheet is mechanically and electrically isolated from the chassis using rubber standoffs. 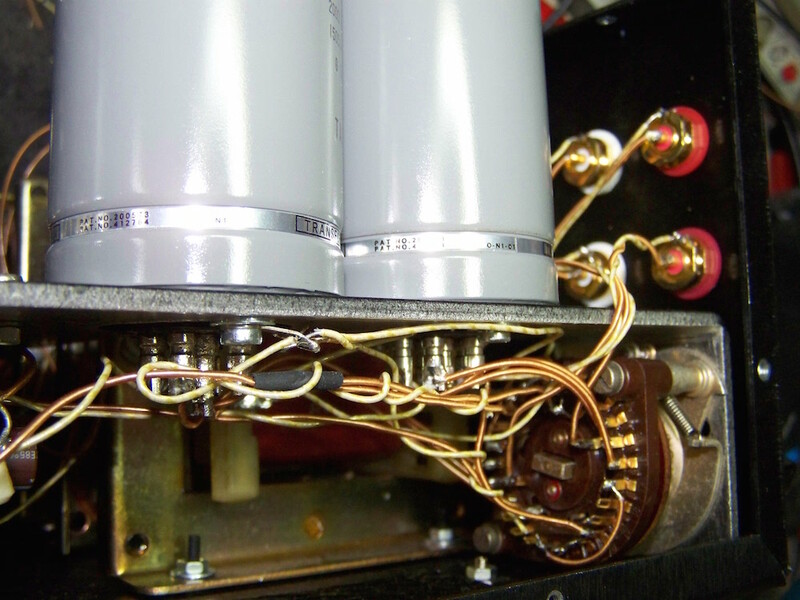 So is the power transformer to prevent its unevitable 50hz hum from entering the chassis. If in need for the neccesary powersupply transformer and choke, Vlaartronic has these available, silent and for reasonable money (recommended!). So the chassis itself is connected to the mains earth only, carrying no signal ground. I used some damping material for the chassis and made extra holes in the bottom provinding airflow from the bottom up since only cooling openings were present on top. 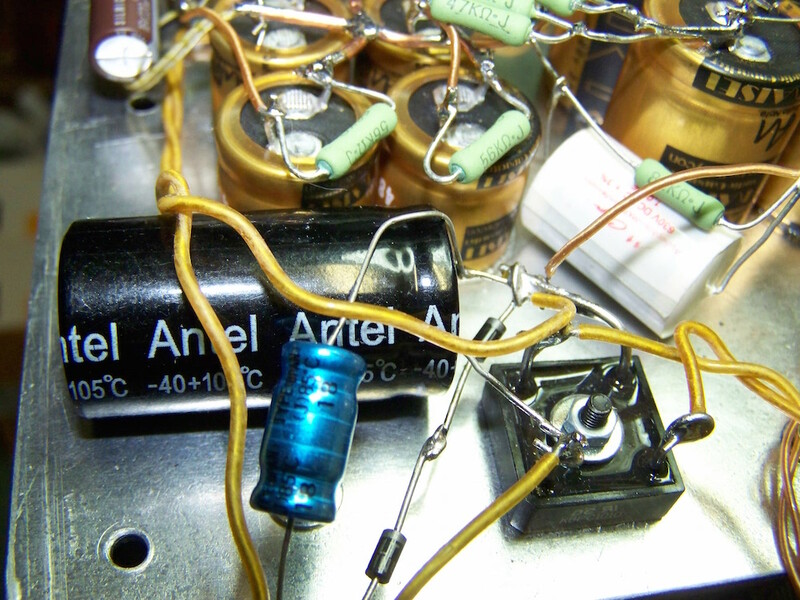 The output or line-out transformers used are AE-Europe made. Oversized amorphous core, wound bifilar 1:1, these are custom made thus costly. If in for some quality replacement, Vlaartronic can supply these on SiFe core for less.. A step down (2:1 or more) is not recommended because this will result in insufficient gain. Well, that leaves me with lots of pictures of the building process which can be seen below.. Determining lay-out and placement of damping material. 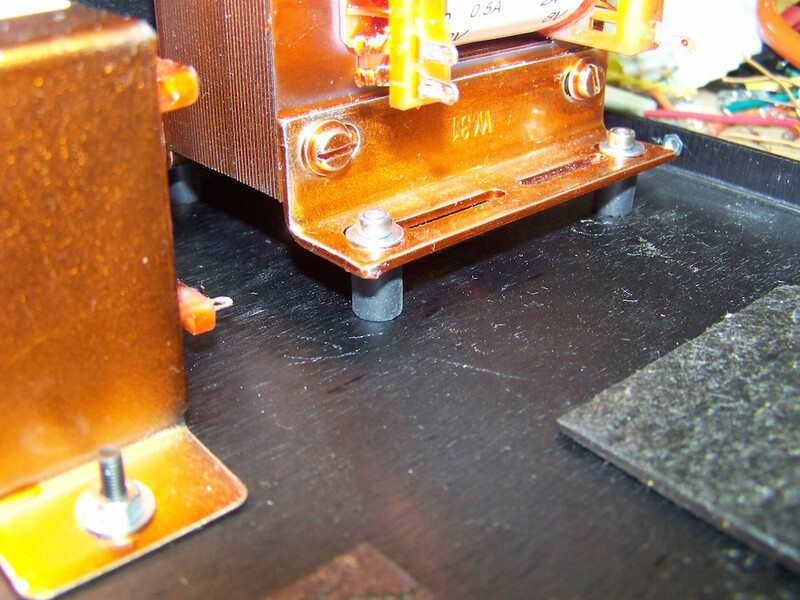 Rubber standoffs for the Vlaartronic power transformer. 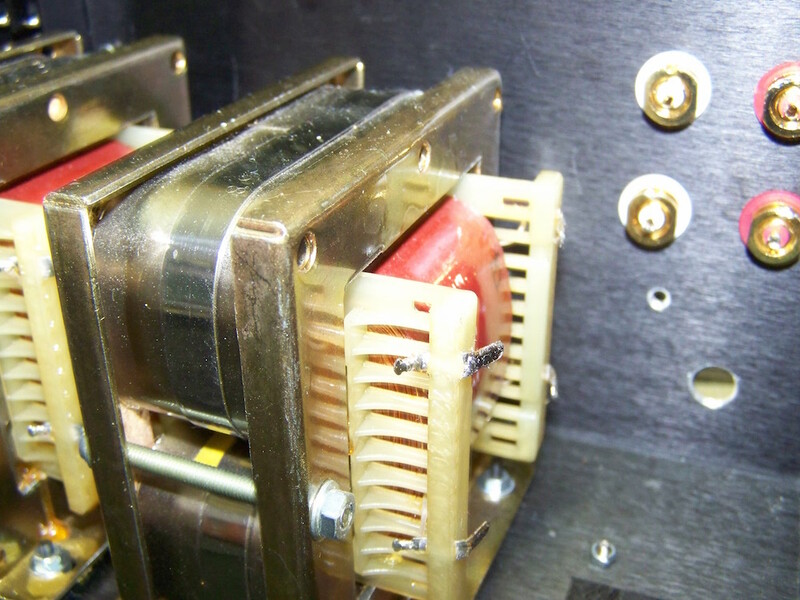 Line out transformers by AE-Europe, 1:1 bifilar wound, amorphous core. 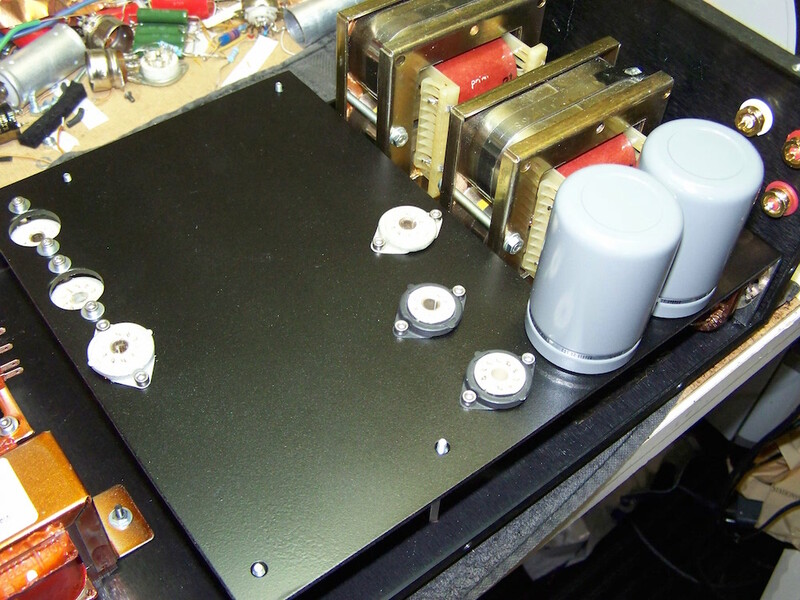 Powersupply and signal section on aluminium sheet, painted black. MC step-ups installed. 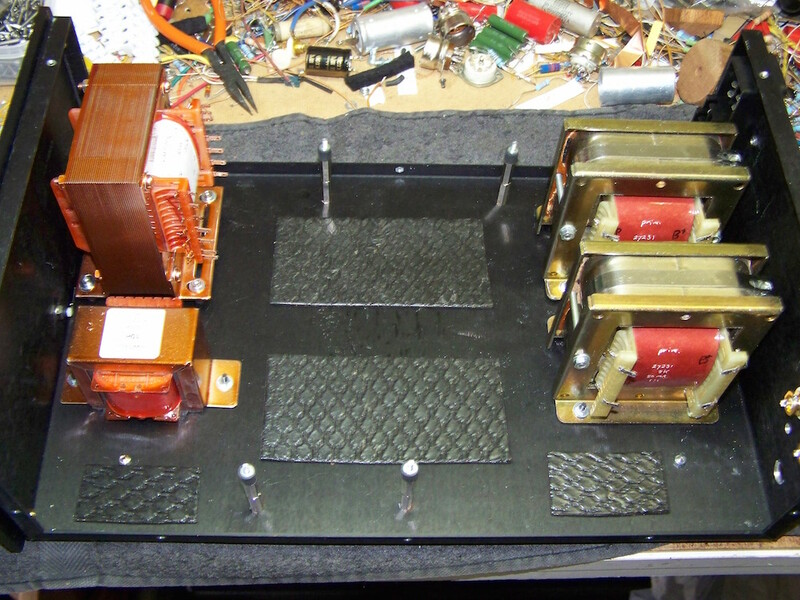 Signal section on rubber standoffs, isolated from the chassis. 4 x 4 Switch, selector for MC and MM. 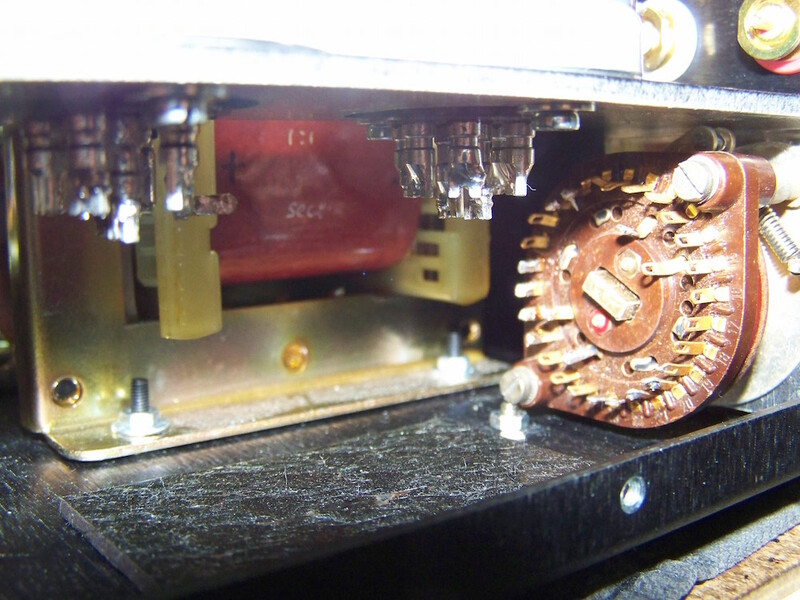 Heater section with regulator on the other side. Voltage regulation circuit with EL84 and EF86. 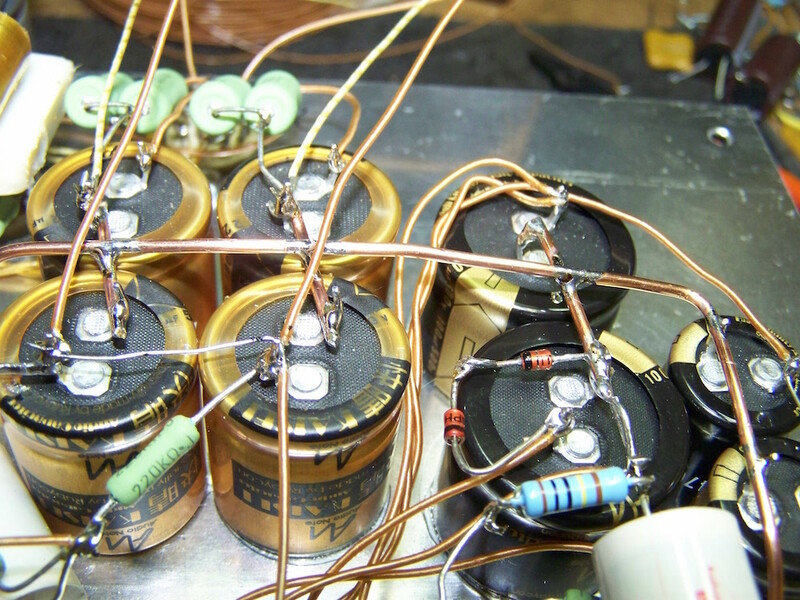 High voltage part with AudioNote caps, Kaisei and standard. 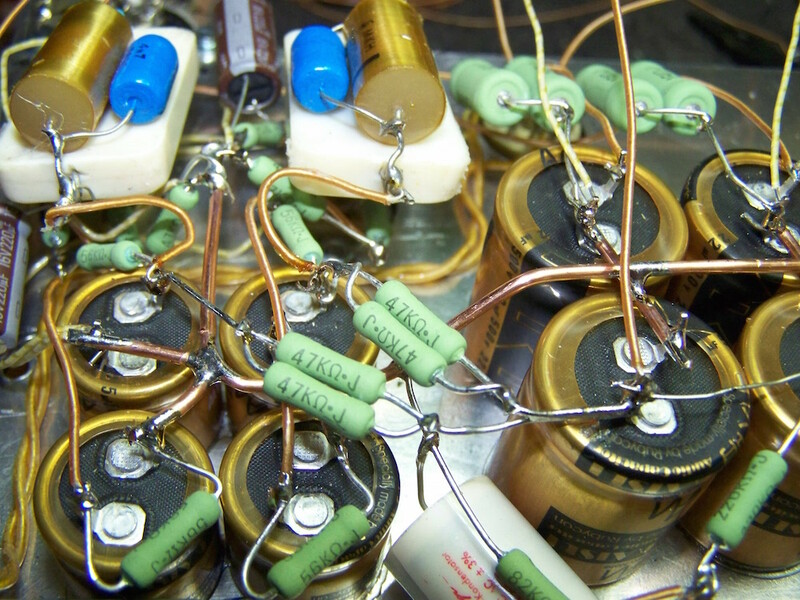 RIAA-correction network with quality capacitors. 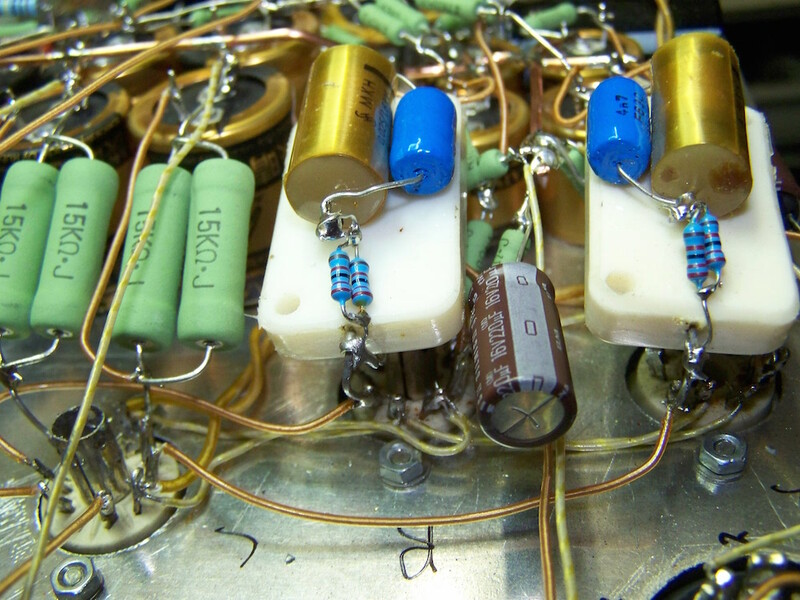 Cathode resistors for the E182CC/5687. 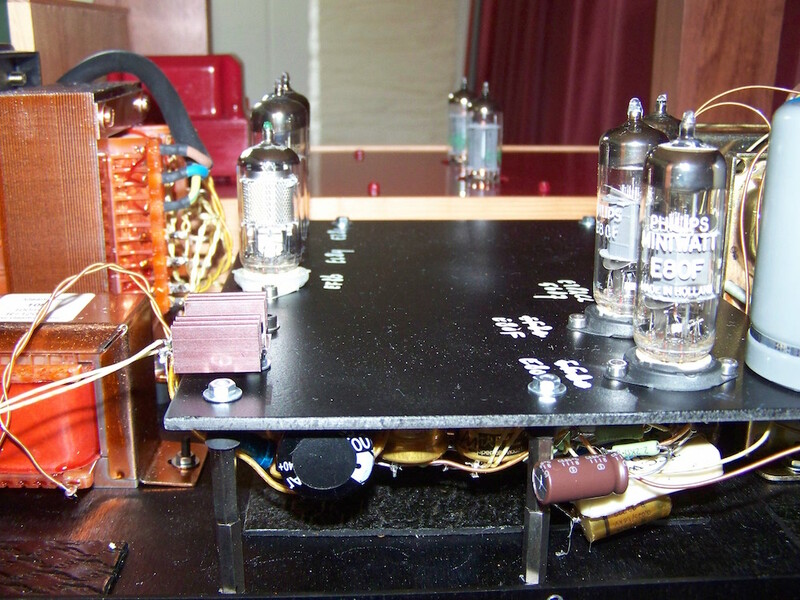 Test run of the finished amplifier..
..showing the Vlaartronic transformers and heatsinked 78S05 (this one is NOT suitable for the 5687!). MM and MC switch wiring. Ready! Showing the drilled ventilation holes..